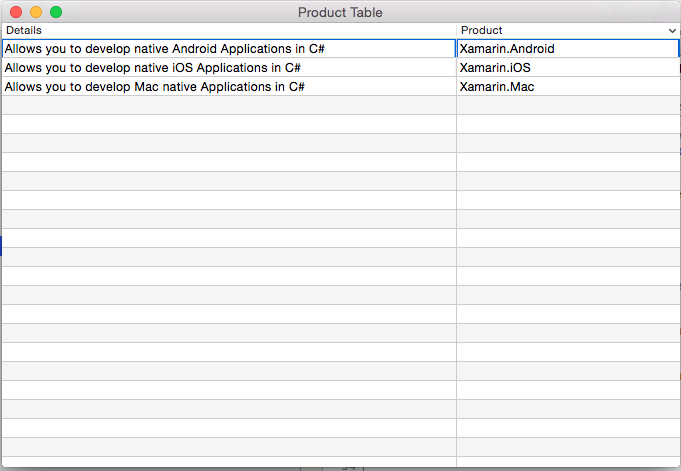 This article covers working with table views in a Xamarin.Mac application. 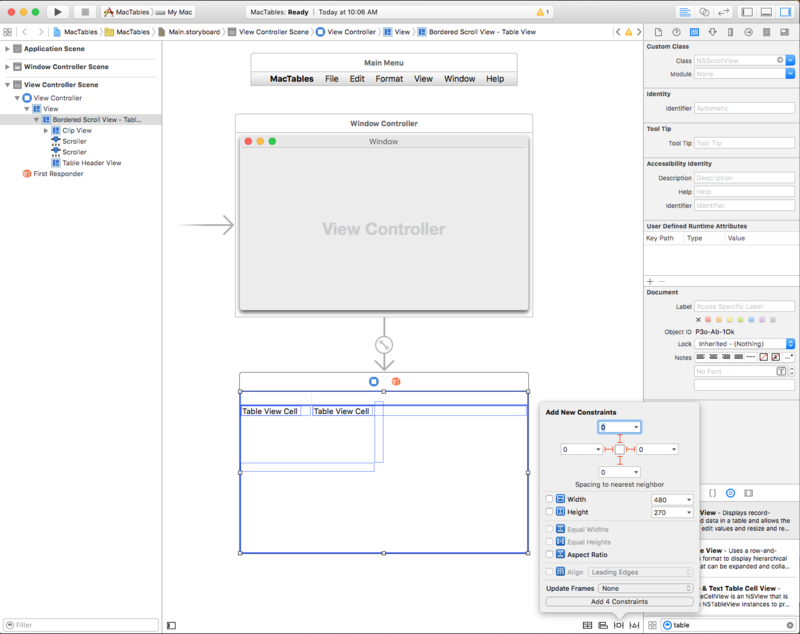 It describes creating table views in Xcode and Interface Builder and interacting with them in code. 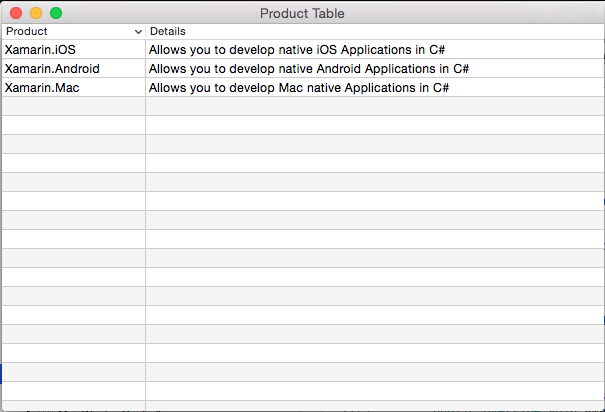 When working with C# and .NET in a Xamarin.Mac application, you have access to the same Table Views that a developer working in Objective-C and Xcode does. 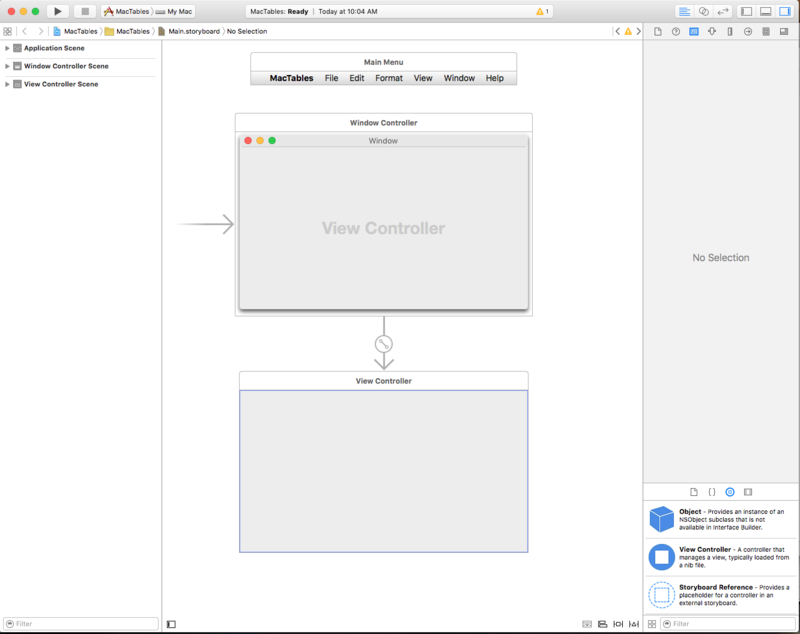 Because Xamarin.Mac integrates directly with Xcode, you can use Xcode's Interface Builder to create and maintain your Table Views (or optionally create them directly in C# code). A Table View displays data in a tabular format containing one or more columns of information in multiple rows. Based on the type of Table View being created, the user can sort by column, reorganize columns, add columns, remove columns or edit the data contained within the table. 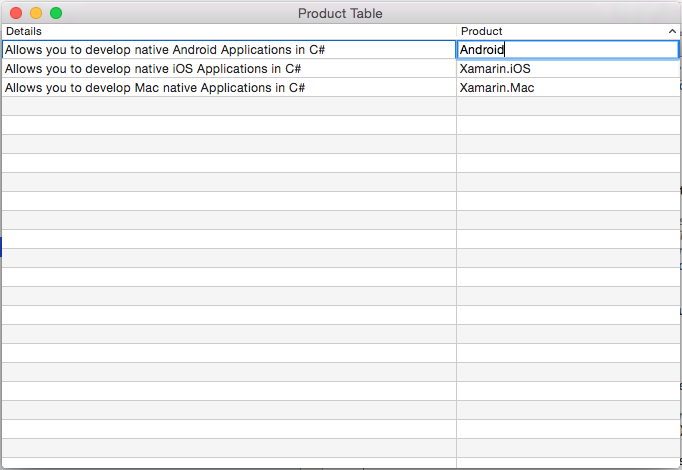 In this article, we'll cover the basics of working with Table Views in a Xamarin.Mac application. It is highly suggested that you work through the Hello, Mac article first, specifically the Introduction to Xcode and Interface Builder and Outlets and Actions sections, as it covers key concepts and techniques that we'll be using in this article. A Table View displays data in a tabular format containing one or more columns of information in multiple rows. Table Views are displayed inside of Scroll Views (NSScrollView) and starting with macOS 10.7, you can use any NSView instead of Cells (NSCell) to display both rows and columns. That said, you can still use NSCell however, you'll typically subclass NSTableCellView and create your custom rows and columns. A Table View does not store it's own data, instead it relies on a Data Source (NSTableViewDataSource) to provide both the rows and columns required, on a as-needed basis. A Table View's behavior can be customized by providing a subclass of the Table View Delegate (NSTableViewDelegate) to support table column management, type to select functionality, row selection and editing, custom tracking, and custom views for individual columns and rows. Allow the user to sort the table by clicking on a Column Headers. Create Column Headers that are nouns or short noun phrases that describe the data being shown in that column. For more information, please see the Content Views section of Apple's OS X Human Interface Guidelines. Content Mode - Allows you to use either Views (NSView) or Cells (NSCell) to display the data in the rows and columns. Starting with macOS 10.7, you should use Views. Floats Group Rows - If true, the Table View will draw grouped cells as if they are floating. Columns - Defines the number of columns displayed. Headers - If true, the columns will have Headers. Reordering - If true, the user will be able to drag reorder the columns in the table. Resizing - If true, the user will be able to drag column Headers to resize columns. Column Sizing - Controls how the table will auto size columns. Highlight - Controls the type of highlighting the table uses when a cell is selected. Alternate Rows - If true, ever other row will have a different background color. Horizontal Grid - Selects the type of border drawn between cells horizontally. Vertical Grid - Selects the type of border drawn between cells vertically. Grid Color - Sets the cell border color. Background - Sets the cell background color. Multiple - If true, the user can select multiple rows and columns. Column - If true,the user can select columns. Type Select - If true, the user can type a character to select a row. Empty - If true, the user is not required to select a row or column, the table allows for no selection at all. Autosave - The name that the tables format is automatically save under. Column Information - If true, the order and width of the columns will be automatically saved. Line Breaks - Select how the cell handles line breaks. Truncates Last Visible Line - If true, the cell will be truncated in the data can not fit inside it's bounds. 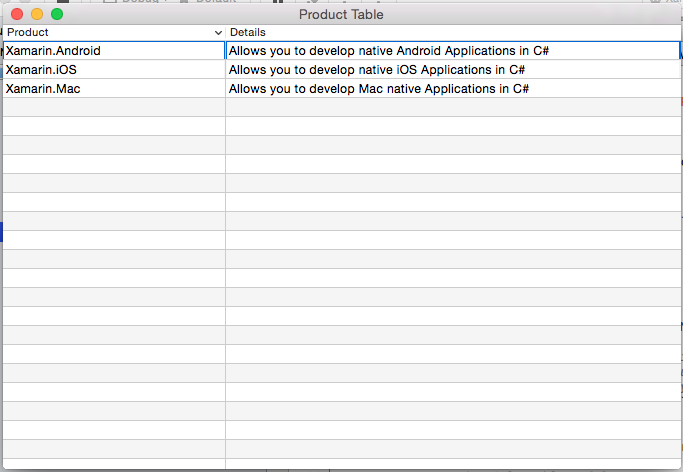 Unless you are maintaining a legacy Xamarin.Mac application, NSView based Table Views should be used over NSCell based Table Views. NSCell is considered legacy and may not be supported going forward. Title - Sets the title of the column. Alignment - Set the alignment of the text within the cells. Title Font - Selects the font for the cell's Header text. Sort Key - Is the key used to sort data in the column. Leave blank if the user cannot sort this column. Selector - Is the Action used to perform the sort. Leave blank if the user cannot sort this column. Order - Is the sort order for the columns data. Resizing - Selects the type of resizing for the column. Editable - If true, the user can edit cells in a cell based table. Hidden - If true, the column is hidden. You can also resize the column by dragging it's handle (vertically centered on the column's right side) left or right. Let's select the each Column in our Table View and give the first column a Title of Product and the second one Details. These are all of the properties of a standard View. You also have the option of resizing the rows for this column here. You'll have all the properties of a standard text field to set here. By default, a standard Text Field is used to display data for a cell in a column. Layout - Select how cells in this column are laid out. Uses Single Line Mode - If true, the cell is limited to a single line. First Runtime Layout Width - If true, the cell will prefer the width set for it (either manually or automatically) when it is displayed the first time the application is run. Action - Controls when the Edit Action is sent for the cell. Behavior - Defines if a cell is selectable or editable. Rich Text - If true, the cell can display formatted and styled text. Undo - If true, the cell assumes responsibility for it's undo behavior. This allows you to edit the Table Cell View used as the base Pattern for all cells created for the given column. Just like any other Cocoa UI control, we need to expose our Table View and it's columns and cells to C# code using Actions and Outlets (based on the functionality required). 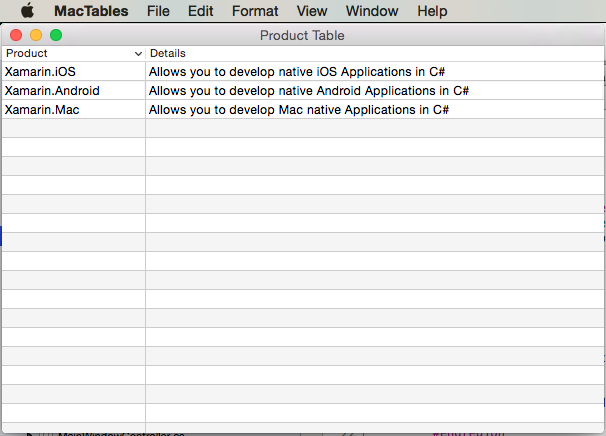 Select the Table View from the Interface Hierarchy, control-click and drag to the ViewController.h file. 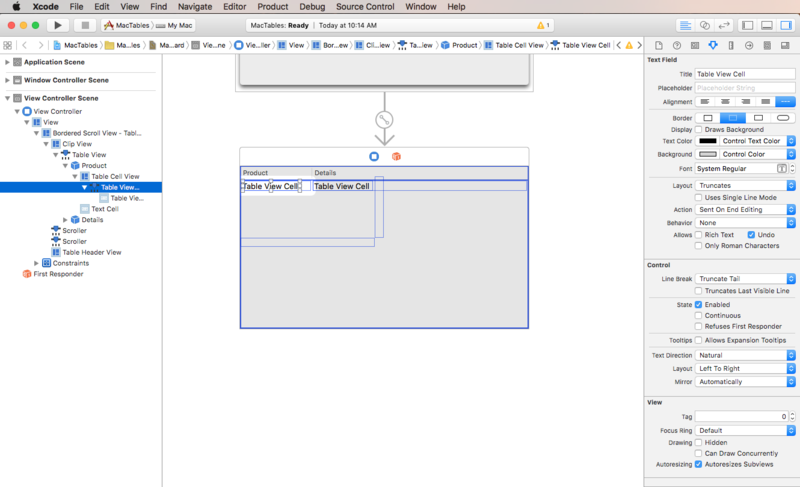 Save you changes and return to Visual Studio for Mac to sync with Xcode. Next, we'll write the code display some data for the table when the application is run. With our Table View designed in Interface Builder and exposed via an Outlet, next we need to create the C# code to populate it. Next, we need to create a subclass of NSTableDataSource to provide the data for our table as it is requested. In the Solution Explorer, right-click the Project and select Add > New File... Select General > Empty Class, enter ProductTableDataSource for the Name and click the New button. This class has storage for our Table View's items and overrides the GetRowCount to return the number of rows in the table. Finally, we need to create a subclass of NSTableDelegate to provide the behavior for our table. In the Solution Explorer, right-click the Project and select Add > New File... 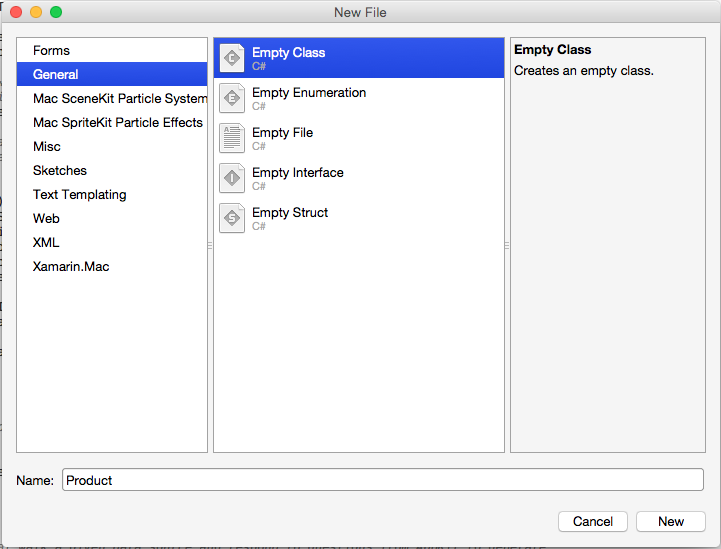 Select General > Empty Class, enter ProductTableDelegate for the Name and click the New button. // This pattern allows you reuse existing views when they are no-longer in use. When we create an instance of the ProductTableDelegate, we also pass in an instance of the ProductTableDataSource that provides the data for the table. The GetViewForItem method is responsible for returning a view (data) to display the cell for a give column and row. If possible, an existing view will be reused to display the cell, if not a new view must be created. The Sort method allow us to sort the data in the Data Source based on a given Product class field in either ascending or descending order. The overridden SortDescriptorsChanged method will be called every time the use clicks on a Column Heading. It will be passed the Key value that we set in Interface Builder and the sort order for that column. This will allow the user to select any single row in the Table View. Return false for the ShouldSelectRow for any row that you don't want the user to be able to select or false for every row if you don't want the user to be able to select any rows. DeselectRow(nint) - Deselects the given row in the table. SelectRow(nint,bool) - Selects the given row. Pass false for the second parameter to select only one row at a time. SelectedRow - Returns the current row selected in the table. IsRowSelected(nint) - Returns true if the given row is selected. DeselectAll(NSObject) - Deselects all rows in the table. Use this for the first parameter to send in the object doing the selecting. SelectAll(NSobject) - Selects all rows in the table. Use this for the first parameter to send in the object doing the selecting. SelectRow(nint,bool) - Selects the given row. Pass false for the second parameter clear the selection and select only a single row, pass true to extend the selection and include this row. SelectRows(NSIndexSet,bool) - Selects the given set of rows. Pass false for the second parameter clear the selection and select only a these rows, pass true to extend the selection and include these rows. SelectedRows - Returns a NSIndexSet containing the indexes of the selected rows. SelectedRowCount - Returns the number of selected rows. The GetNextTypeSelectMatch method takes the given searchString and returns the row of the first Product that has that string in it's Title. If we give a value for the Autosave property and check the Column Information field, any changes we make to the table's layout will automatically be saved for us and restored the next time the application is run. For more information, please see the Using Images with Table Views section of our Working with Image documentation. Based on the requirements of your app, there might be occasions where you need to supply an action button for each row in the table. As an example of this, let's expand the Table View example created above to include a Delete button on each row. 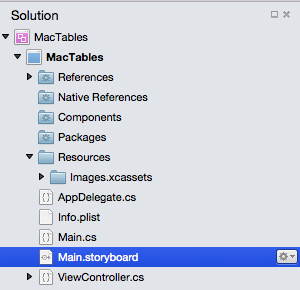 Save the changes to the Storyboard and return to Visual Studio for Mac to sync the changes. This takes all of the Text View configurations that were previously being done in the GetViewForItem method and places them in a single, callable location (since the last column of the table does not include a Text View but a Button). // Should we delete the requested row? Let's look at several sections of this code in more detail. First, if a new NSTableViewCell is being created action is taken based on the name of the Column. For the first two columns (Product and Details), the new ConfigureTextField method is called. For the Action column, all Sub Views are scanned until the NSButton is found, then it's Tag property is updated to point at the current Row. For more information, please see the Table View Data Binding section of our Data Binding and Key-Value Coding documentation. 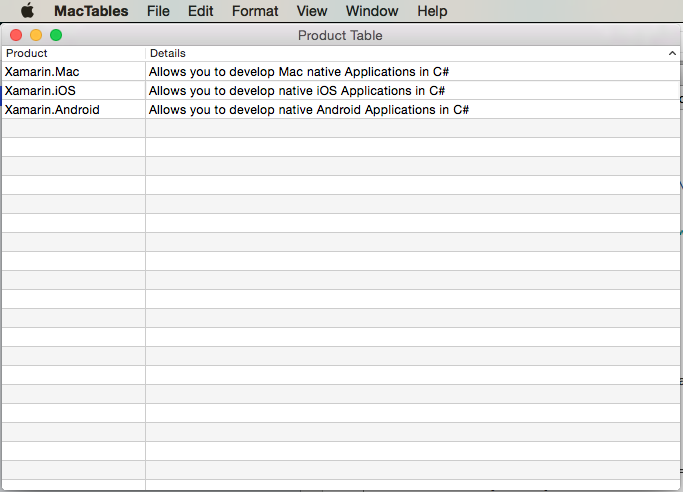 This article has taken a detailed look at working with Table Views in a Xamarin.Mac application. 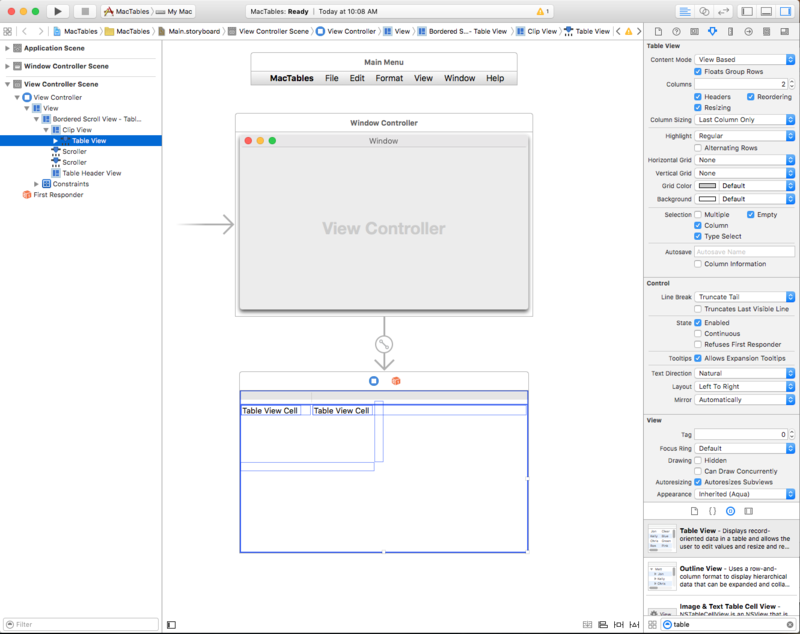 We saw the different types and uses of Table Views, how to create and maintain Table Views in Xcode's Interface Builder and how to work with Table Views in C# code.